I’m a Gael Greene fan; I love her fashion sense (who wouldn’t admire that collection ofwide-brimmed hats) — and have always been interested in her food writing and restaurant critiques, especially since she was born and raised in Detroit, often mentioning the city in her work. Ms. Greene graduated from the University of Michigan and became New York magazine’s restaurant critic in 1968, a time when most Americans thought the invention of canned and frozen foods were the greatest thing since Wonder Bread. In her 2006 memoir, “Insatiable; Tales from a Life of Delicious Excess,” she describes herself as a “sensuous eater,” and her romantic exploits — invariably linking to food — include liaisons with Elvis, Burt Reynolds and Clint Eastwood. A woman of the world, indeed, but one recipe in her book is as girl-next-door as Mom’s Apple Pie. On page 19 (following her description of a romantic escapade on Michigan’s Drummond Island, where for her “…love and food became inextricably linked.”), she pens a recipe for “Almost Like Mom’s Macaroni & Cheese”. After an afternoon spent raking and bagging the final vestiges of Fall, Macaroni and Cheese sounds particularly appealing so I decided to use her recipe to guide my own. First, I doubled the ingredients in her recipe, adjusting the cooking time accordingly; if I was going to the trouble, I want to make more than two servings. But surprise! Doubling her recipe yielded a solid six main course portions. No worries, the leftovers were delicious reheated. I always add a bit of blue cheese to my mac & cheese casseroles; just enough to lend an assertive cheesy flavor profile. When I owned the Back Alley Gourmet, our Mac & Cheese casserole varied according to the bits and pieces of leftover cheese we needed to use. 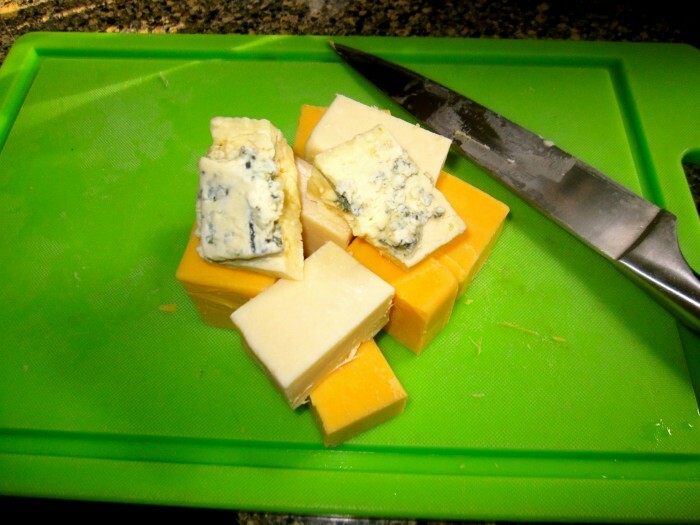 But one cheese was always incorporated: blue cheese — and we only used a tad, not so much that it was recognizable, but enough to give the end result a solid cheese flavor profile. In the following recipe, I used about three-quarters of two excellent sharp Cheddars, and a quarter (or less) of blue cheese. I also used crispy panko instead of regular bread crumbs and changed the technique slightly. The cheeses lent enough sodium for me, so I skipped the bacon. Adding a hefty pinch of cayenne was a good idea as well. It didn’t add much heat, but using cayenne with discretion causes flavors to bloom, especially in cheese-centric dishes. For the unblemished rendition of this recipe, I encourage your reading the recipe in its original version to get a true flavor of her inimitable style of writing. I added my own Alabama-born mom’s twist to the recipe, incorporating (unsweetened) evaporated milk. Mom said it added almost the same creaminess of half-and-half, without as many calories. Using panko instead of breadcrumbs makes it even crispier. If you’re reading the recipe, craving scratch-made Mac & Cheese, but have no time to cook, stop by Zingerman’s Roadhouse. Chef Alex has graciously penned his version of the recipe, which is a symphony of pan-cooked cheesy goodness in a creamy bechamel, perfect if you prefer cream over crisp, and especially yummy when it caramelizes in the pan. Michigan certainly spawns an array of Mac & Cheese aficionados, and from my experience — whether crispy or creamy — when craving comfort food, homemade Mac & Cheese is as good as it gets. Brush bottom and sides of a shallow 12-cup oven-safe baking dish with olive oil. Cook macaroni according to package instructions, or until just tender (Note: don’t overcook pasta as it will continue to cook in the oven.) Drain noodles well, shaking colander, then immediately turn macaroni back into pot and toss with cheese while the pasta is hot, (a flat baking pan gives more crispiness than a loaf pan). 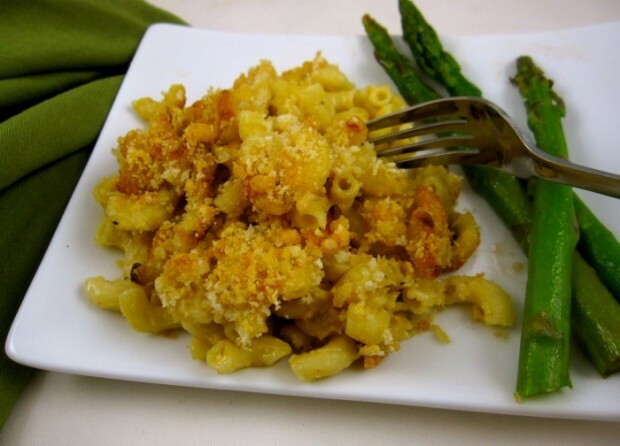 Toss macaroni with 2 tablespoons of olive oil, cheese, ham or bacon, if using, and milk, half & half or evaporated milk. Season to taste with kosher salt, if needed, and freshly ground pepper. Bake on center rack of oven 12 minutes. 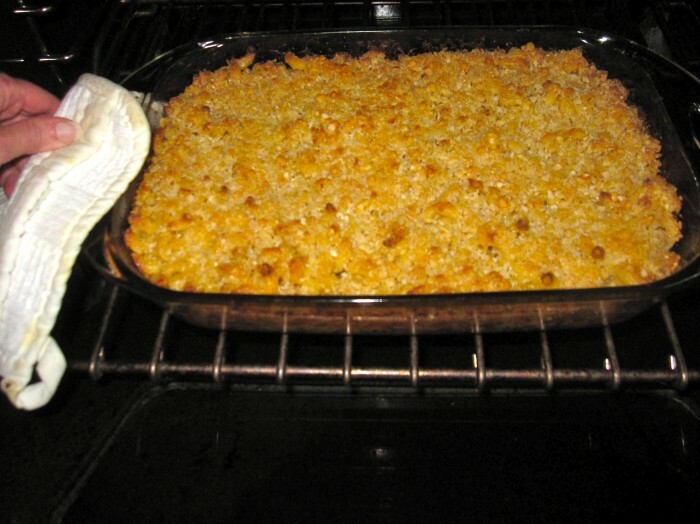 Remove, close oven door, stir macaroni mixture, then evenly coat top with panko and Parmesan. Bake an additional 20-25 minutes. (Note: If milk remains in the bottom, return to the oven for another 5 to10 minutes. If topping has not browned and crisped, stick it under the broiler (three or four inches away from heat) and brown, watching so it doesn’t burn. Geia sou eufuestate povtare! Eimai filh ths Marias, aka Sunny and Cher. H kuria auth, pou les, moirazetai kamia fora mazi mou to blog sou kai mpainw kai se diabazw. (Euge!) Auta pou les edw gia tous Ellhnes einai APOLUTWS swsta. Ws ellhnida pou zw tosa xronia “ejw” (America), blepw jeka8ara auth th dixasmenh proswpikothta tou ellhna genikotera kai mesa apo th dikh mou sumperifora kai mesa apo allwn ellhnwn (metanastwn kai mh). Otan, px, pianoume thn ampelofilosofia, gia kapoio logo fortwnoume, kokkinizoume, gemizoume pa8os kai energeia kai 8eloume na paradextoun oloi to dikio mas–alla molis ta broume skoura sth grafeiokratia ‘h se o,tidhpote sunepagetai epafh me thn “ejousia”… e, de bariesai, ti 8a pw egw pou 8’allajei ta pragmata, pame gia kana kafedaki, ktl. Me alla logia, apofeugoume th maxh otan auth jeroume pws fernei mazi ths to risko ths pragmatikhs apotuxias (dhl. otan exeis pragmati kati na xaseis, px thn autoektimhsh sou)… Omws otan exoume thn eukairia na bgaloume ta maxairia gia mpourdes (filosofika 8emata, politikh, podosfairo) to kanoume euxaristws giati kai na xasoume th maxh den paei na pei oti xasame thn autoektimhsh mas oute pesame sta matia twn allwn. Polla lew. Anyway, gia ena paromoio munhma sou proteinw to “The Xenophobe’s Guide to the Greeks”. Grammeno eilikrina kai me polu xioumor, kata th gnwmh mou einai h pio akribhs perigrafh tou laou mas. Filia sth mikrh moloxa!